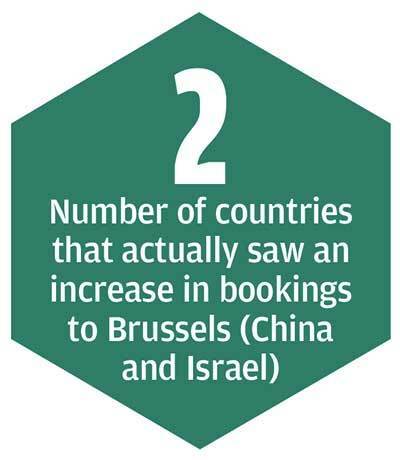 Research shows how Europe’s latest terror attack in Belgium’s capital impacted bookings. Patrick Whyte reports on the findings. The Brussels bombings have had a bigger impact on travel to the destination than last year’s attack on Paris, according to a study of bookings in the aftermath of the event. Research from ForwardKeys which measures 14 million daily reservation transactions found that net bookings – new bookings minus cancellations – fell by 136% compared with the previous year. Net bookings to Paris following the coordinated terror attacks last November fell by 101%. Olivier Jager, co-founder and chief executive of ForwardKeys, said the study showed how devastating terror attacks could be on the public’s desire to travel. “Our analysis confirms what many must have suspected, that once again terrorism is having a fundamental impact on international travel,” he said. The attacks occurred at two key transport hubs in the Belgian capital: at the airport in Zaventem and at Maalbeek Metro station in the centre of the city. In total 32 people were killed with hundreds more injured. According to ForwardKeys cancellations are returning to the same level as last year but new bookings are down 32%. Group travel was the hardest segment hit with a 214% decline in net bookings, while leisure trips fell by 150%. The impact of the attacks is likely to continue until the summer, where demand is at a similar level to last year. Fellow Europeans are the group that seem most reluctant to travel to the city, with flight bookings between April 14 and August 31 down 29%. Bookings from the Asia-Pacific region are down 20% and the Americas are down 17%. China (+38%) and Israel (+23%) are actually faring better than last year. ForwardKeys said arrivals from provincial Chinese cities were doing well in July and August, while the increase in Israel was thought to be down to the shift in dates for Passover. Meanwhile, a separate study by Sojern using the “intent to travel” metric, which measures flight search and booking data, found a similar pattern. During the days immediately following the attack, intent to travel fell by as much as 51%, with Sojern speculating that the effect was magnified by the long Easter weekend. The biggest fall for an individual country was from the UK, where there was a week-on-week decline of 67% on Easter Monday. Intent to travel from Italian travellers fell as low as 62% week-on-week, with the same metric for German travellers dropping 56%. When Sojern carried out a similar study on Paris in the wake of last November’s terrorist attacks, the results showed that negative sentiment lasted for a fortnight.